Microsoft hate mandatory profiles, but they are useful. Here’s a guide to creation on Win10. Note:- this article refers to the mandatory profile creation process on Windows 10 version 1803, fully patched as of 16/07/2018. Further servicing updates (Windows patches) or feature updates (OS upgrades) will possibly invalidate this, although I will strive to keep this article as up-to-date as humanly possible. 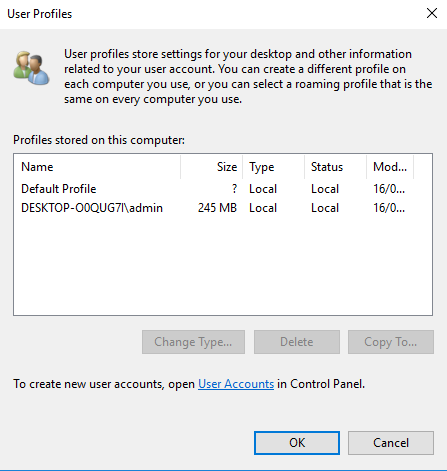 Mandatory profiles (or their bigger brother, super-mandatory profiles) are a variant of the Windows roaming profile that many people still find useful. Changes to a mandatory profile are discarded at logoff, meaning that any modifications the user has made in-session are purged and the profile deleted. This is ideal for educational or kiosk scenarios where a default set of configuration items is required for every logon, or even for environments where people are using third-party profile solutions to hold user settings, such as Ivanti UWM or LiquidWare ProfileUnity. The difference between a mandatory and super-mandatory profile is very simple, the super-mandatory profile will prevent logon if the specified profile is unavailable. 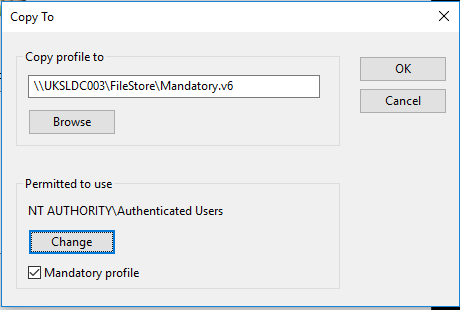 A standard mandatory profile allow the logon to continue if it cannot find the configured profile, and simply load a temporary profile instead. Configuring super-mandatory is essentially the same as configuring a mandatory profile and setting the “Log users off if roaming profile is unavailable” GPO. This is handy for ensuring users can’t sidestep any restrictions built into the profile by logging on with a temporary profile. To make a mandatory profile super-mandatory, you need to name the profile folder with a “.man” suffix, in the same way you rename the ntuser.dat file to ntuser.man. Of course, we don’t want to forget about profile version suffixes. XP and 2003 used “v1” profiles, whereas 7 and 2008/2008 R2 gave us the first version change as they moved to “v2” profiles. Later OSes originally used .v2 by default, but after Windows 8.1 they decided to implement strict versioning for all later implementations of the Windows operating system. You can convert profiles upstream (e.g. take a .v2 profile and make it .v6), but they will no longer be backwards compatible. Should you store them locally in the image, or on the network? The choice is yours, depending on whether you need to maintain access in the event of a network outage, and how easy you want any updates to be. 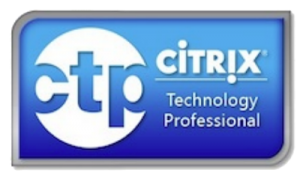 I usually try and get the best of both worlds by having the mandatory profile in the image but updating it from a central file location using scripting, Group Policy Preferences or a tool like Ivanti UWM. Here’s an example of it being updated centrally and pushed out via UWM. 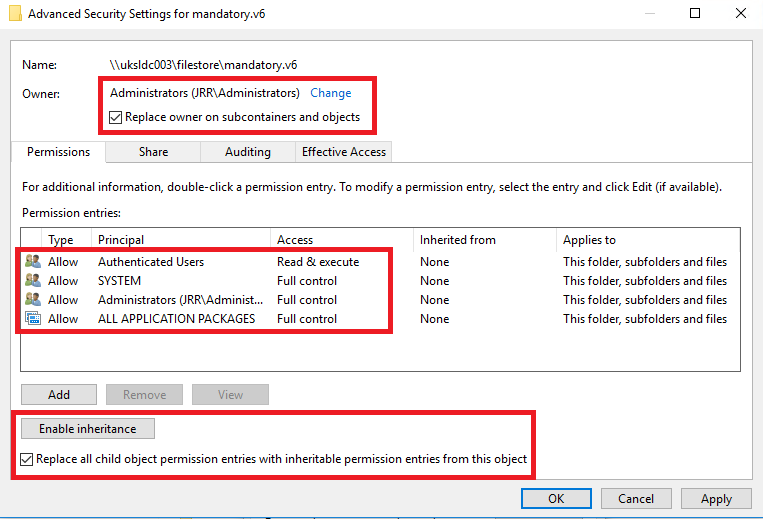 Mandatory profiles can be defined on the user object in AD (on the Profile tab, RDS Profile tab or both of them, as required) or pushed via a Group Policy Object (for RDSH only). Bear in mind, though, that if you define the GPO it is a Computer setting, and will apply to all users logging on to the machine (including Administrators), so if you’ve over-restricted the base profile, test your admin access. I’ve also seen people deploy mandatory profiles in a more targeted fashion using scripts to modify the profile settings. I know I already mentioned this in the previous section, but because so many people fall down on this point I will mention it again 🙂 The path to a mandatory or roaming profile is independent of the actual folder path. For instance, if we defined the path in AD or via GPO as C:\Users\MandatoryProfile, the OS would look for a folder unique to the OS as in the table above. This is because dependent on the operating system that the user logs on to, the “.vx” extension will be automatically added as required. So if a user had a mandatory profile path defined as C:\Users\MandatoryProfile, and they logged on to a Windows 7 machine, the operating system would actually look for the profile in C:\Users\MandatoryProfile.v2 rather than the specific path. This is very handy and means we can define a single mandatory profile path yet have multiple, OS-dependent profiles available. So, we’ve run through all of the considerations and given you a lovely table of OS profile versions, but what do we have to do to create a mandatory profile? Specifically, we’re going to talk about doing it on Windows 10 1803, but the instructions below should be valid in their most part for other operating systems as well. The most time-consuming part needs to be done first 🙁 What you need to do is create a custom default profile as specified in this article. When creating the custom default profile, make sure you add all required user-level customizations into your default profile, because this is what we will convert into the mandatory profile. On Windows 10, you can’t convert anything other than the default profile into a mandatory profile (although you could copy and paste the underlying profile folder, but this way is technically unsupported, and make sure you grab all the hidden and system files too if you go this way). Personally, although it takes a bit of time and may involve spinning up an additional Windows 10 image (which you can just discard as soon as you’re finished), I would go this way – at least it means you know you’re not giving any support vendors a “get out of jail free” card. Once you have resolved any access issues, click OK and the profile will be copied. What is odd is that there is no success dialog and the window for copying the profile remains open – once you’ve clicked OK and it has copied, you must then click Cancel to exit the dialog box. Now that we’ve actually got the right files copied, we can check that the filesystem permissions are OK. The file copy will have added Authenticated Users with RX permissions, but we also need to make sure the All Application Packages user has access as well. 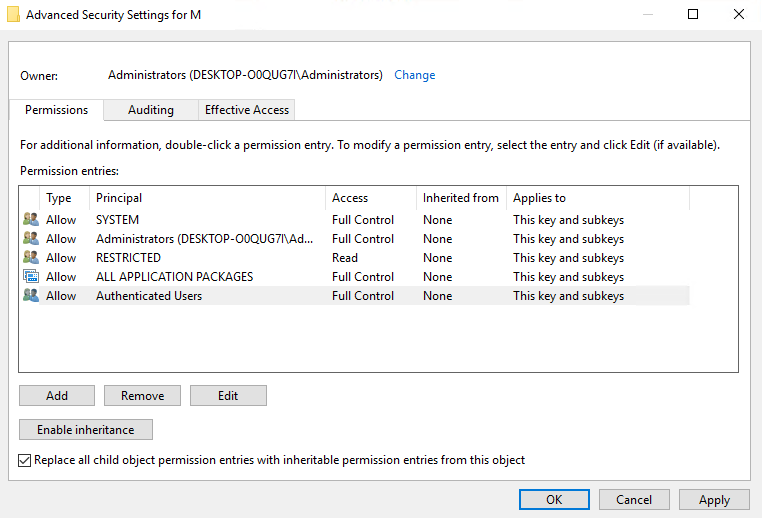 Make the permissions on the root folder of your mandatory profile store as below, and set them to propagate. Also, make sure that the Administrators group owns the folder, and all subfolders. The pertinent settings are highlighted below. Now we need to do the same for the Registry, but we need to be a little more careful here. 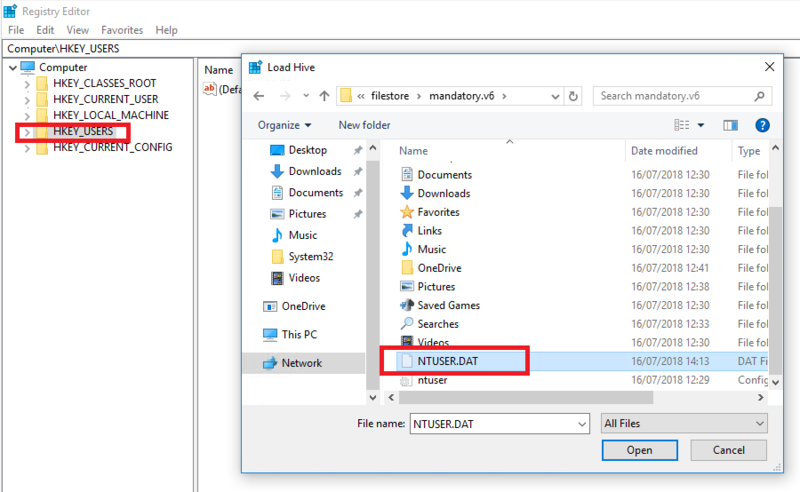 Open the Registry file (ntuser.dat) from your mandatory profile folder by running regedit.exe, highlighting the HKEY_USERS hive, then clicking on File and choosing Load Hive. Browse to the folder where the mandatory profile is and select the ntuser.dat file (it is hidden, so make sure you are showing hidden files before running the Registry Editor). Once you do this it will ask you to give the hive a name, simply type anything in as this will not be saved anywhere. 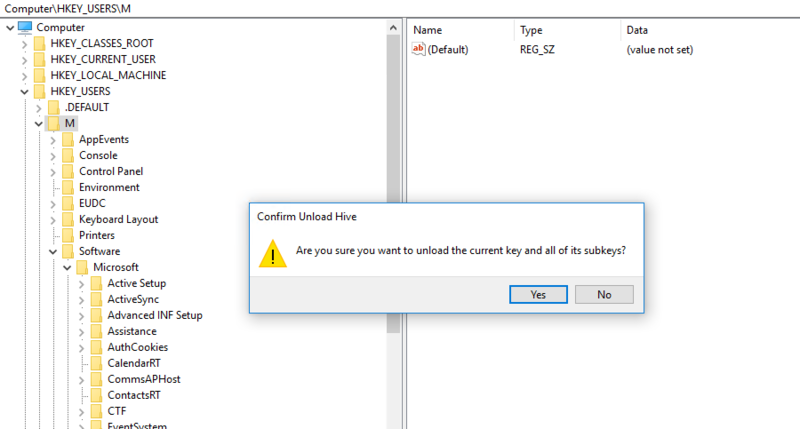 The hive will now show as loaded under HKEY_USERS with the name you have given it. You can then right-click on the root of the hive and select Permissions. Modify it again so that it looks like this (this time we have given Authenticated Users Full Control, because the Registry is essentially a filesystem within a file that has its own ACLs). When clicking OK, it is normal to see an error like this, as some of the subkeys cannot be accessed. Now, one of the questions that always comes up here is, because Authenticated Users now have Full Control over the Registry in the mandatory profile, does that mean that a tech-savvy user could access the Registry of a user on the same system, or another? Well, firstly, the Registry as I said is a filesystem within a file, and the “file” outside of it is locked down on an NTFS basis. So really, a user shouldn’t be able to load or access the Registry of another user in any normal situation. But just in case there was an instance where they could, there are a couple of things you can do to mitigate this. Firstly. prevent the running of regedit.exe or cmd.exe/PowerShell.exe (because you can invoke Registry changes from the command prompt) for non-admin users via GPO, AppLocker or another tool. Secondly, maybe even run a script just after logon that resets the permissions on the current user’s Registry so that the entry for Authenticated Users is replaced by one for the user themselves. In a high-security environment this might be necessary, but for most normal operations the NTFS protection on the ntuser.dat file should suffice to prevent any unauthorized access. Whilst we’ve got the Registry file “open”, we can remove stuff from the Registry that shouldn’t be there. Firstly, we can remove references to the user who the profile was created under, which if you used the default profile method will be “Administrator”. Remove all references to the Administrator username from the Registry hive (there is a Find command you can use for this in regedit). If you’ve used a domain account to create the mandatory profile, then also at this point search for any references to the SID of the user and remove them as well (psgetsid is ideal if you need to find the user SID). You can also go through, if you wish, and delete any Registry keys or values that you deem unnecessary. Prime example of unnecessary keys would be any Policies keys – generally found in HKCU\Software and also in HKCU\Software\Microsoft\Windows\CurrentVersion. Once you’ve done all of this, don’t forget to unload the profile by clicking File | Unload Hive with the top-level key selected, otherwise you will lock the profile and no-one will be able to access it. This has happened to me in the past, so be warned, it’s easy to do! 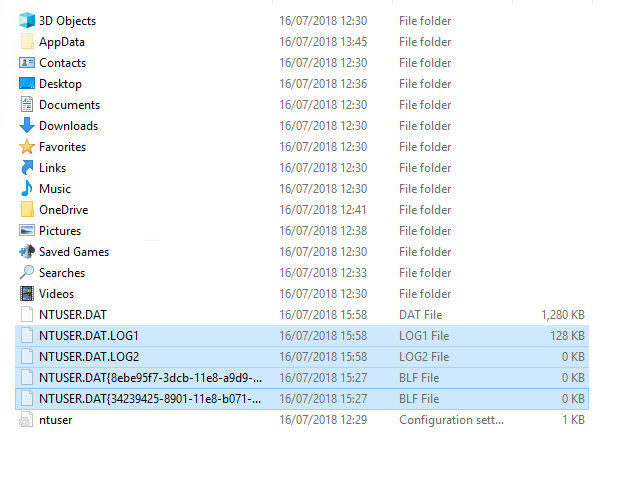 Once you’ve edited the Registry file you will notice a bunch of *.log* and *.blf files in the folder where your profile is stored. Just delete these. Now, to truly make this “mandatory” rename the ntuser.dat file to ntuser.man. If you’re going super-mandatory, rename the holding folder to one with a .man.vx suffix (if you hadn’t already). 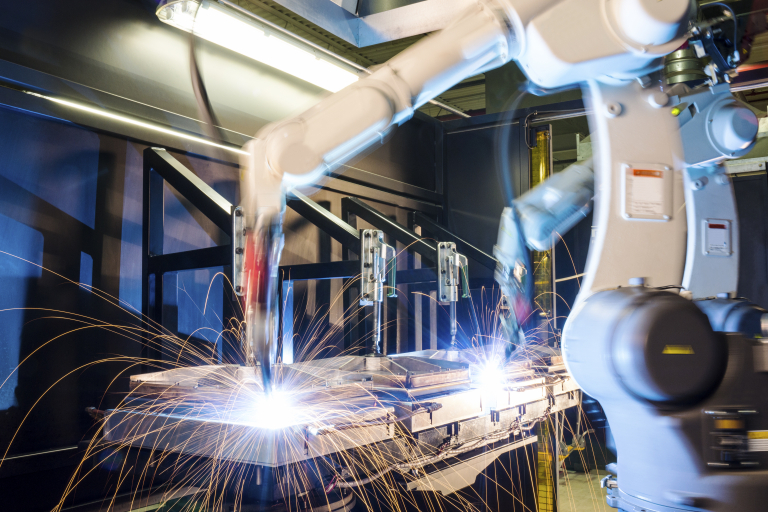 Check that you have got the Group Policy Object configured for Computer Config | Admin Templates | Windows Components | App Package Deployment | Allow deployment operations in special profiles set to Enabled. If you have UWP apps in your image, without this GPO set it cannot deploy them into special (roaming/mandatory/super-mandatory) profile types and you will end up with a broken Start Menu. The final step is to populate the user’s Profile or Remote Desktop Services Profile field in ADUC with the path to the mandatory profile (minus the suffix, remember!) 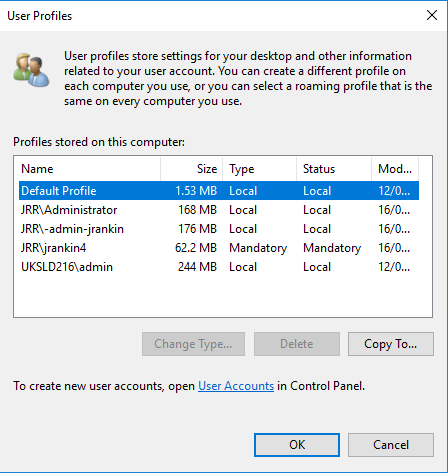 If you’re using RDSH and you want to use the GPO method, populate the path into the GPOs for mandatory profiles (found in Computer Config | Policies | Admin Templates | Windows Components | Remote Desktop Services | Remote Desktop Session Host | Profiles | Use mandatory profiles on the RD Session Host server and Set path for Remote Desktop Services Roaming User Profile). Now log in as a (different) test user and see if you get the mandatory profile loaded (you can check the profile type from the sysdm.cpl applet or Registry, or simply see if the user profile changes persist between logons). If you’ve followed everything in this article, you should hopefully have no issues. Adding the All Application Packages to the ACL for filesystem and Registry and making sure the GPO for deployment operations is set are the two biggest mistakes people make. Check that the User Profile Service is running and that you can access the location where the profile is stored, be it local or networked. If you do get issues, especially if logon fails, then checking the event log is paramount. The User Profile Service logs any errors here and you should be able to figure them out from the details here. For those of us who still use mandatory profiles (and there are more of them than anyone would think), using this guide should help you avoid the pitfalls you may well encounter on Windows 10 version 1803. I will try and record a video to go along with this, as well as possibly keep it updated for newer Windows 10 versions. Hi, I am following your instructions and am stuck at the point of setting permissions on filesystem. I cannot work out how to add all application packages when editing permissions on the file share. The file server is 2008 r2. That group is not found. I am unable to add all application packages to the permissions on the 2008 r2 file share where the profile is stored. This security group doesn’t exist. Please help. If it’s not there it can’t be added, I believe this group arrived in 2012 or 2012 R2. I would test without it, if it doesn’t work you may need to migrate to an upstream file share. Apparently, since 1803, mandatory profiles have not worked with Chrome. See CR838707 for additional refs. Watching the video How to set up a mandatory profile on Windows 10 Creators Update (1703) I saw that we should not put the extension .V6 in the profile path in the DA. Hi, at what point are you receiving this error? I decided this problem. Mandatory profiles no removed after logout user. I added key Delete Roaming Cache in reestr. And rename profile mandatory.man.v6 and path mandatory.man. Now all OK. But i got new problem. In my test system, with mandatory profile, not work Windows 10 modern app. In you video, i see calculator is work. Hello – followed your instructions – Thanks Very Much!! But, I must be missing something as when assigning mandatory profile to a user, everything seems to work, but Start Menu will not launch. I am testing with ver 1803… also you mentioned upgrading V2 profiles to V6 profiles… how is that done ? Is it a .v6 profile you are using? Great write-up. Helped out a lot. One problem I have run into is that the user profile is showing as a roaming profile in the sysdm.cpl instead of a mandatory profile. Any thoughts on why? Have you renamed ntuser.dat to ntuser.man? great article. Thanks for the info. You have written that “Microsoft hate mandatory profiles, but they are useful…”. I’m pretty sure that I stumbled upon an official Microsoft article where they mentioned that mandatory profiles are “customized” workarounds and are not recommended, but I’m unable to find it. Do you know if there is anywhere an official statement from Microsoft about it? There is a Microsoft article around mandatory profiles on their site that is periodically updated, but their official line is always “use local”. Thanks al lot for writing these articles! I´m just trying to do it with W10 1809 Education. After the Script my Default Profile Folder ist About 100MB in size, but after copying via Advanced System Setting it´s only about 2MB in size (NTUser.dat and NTUser.ini are in Place) . Can that be OK? What I did with my Win 7 Machines was to copy a Default Profile via Advanced System Settings an then copy this Profile manually to each users Profile-Folder on my Server. For some Users I mades this profiles mandatory (ntuser.man) for other Users I leave the profile open. Will this work for Win 10 also? Yes the idea is to reduce the size by a huge amount, it is normally 1-2 MB afterwards. That method you describe may well work for Windows 10 but seems like a lot of work, to be fair. I did everything as you described but encounter Problems with Startmenu and Layout afterwards (I deploy a Layout-XML via GPO alaong with my RUP). I login one User on a machine end everythimg seems to be OK, Startmenue (left) ist OK, all Programs are listed, also Tiles (right) are there as I defined in my XML. I then logoff that user and log him in on another machine. Here I see no Tiles and a lot of Programs are missing in the Startmenu. I also have this Problem without XML-GPO, on some machines I have a complete Startmenu and Windows “Out-of-the Box-Tiles”, on other Machines I have no Tiles and only an incomplete Startmenu. Looks like the source of this Problem ist mein Roaming Profile, because with local Profiles my Startmenu is ALWAYS complete and also my XML-Startmenu-Layout ist ALWYS displayed right. My be you have an Idea? Not sure, are you using a mandatory or roaming profile? Mandatory would be the next step but at the Moment “only” roaming. Have you got the “allow deployment operations to special profile types” GPO configured? Just doblechecked that: Yes, I have. great tutorial! One problem we have left. We are using 1809 mandatory profiles with redirected folders and when i rename the ntuser.dat to ntuser.man no one is allowed to logon. When a user logs on then a couple of seconds the user is logged out without a warning. When we rename the ntuser.dat to ntuser.man.v6 the user can logon. When the user logs out there is a warning that the Roaming profile was not completely synchronized. In the event viewer there are several events that it isn’t possible to copy the ntuser.dat to the new folder. I hope you will have the same issue in your test enviroment so we can figure this out. When you first install Windows 10 on a VMware VM and get to the list of countries and press Ctrl+Shift+F3 and it boots into audit mode, keep in mind the VMware tools are not installed yet and therefore you have no NIC driver at this point. Also, Windows is not activated at this point (company uses KMS activation and machine needs to be on domain to activate in this way). 1) After the tools install, a reboot is required. How do you get back into audit mode since you will load past the country selection screen and can’t press Ctrl+Shift+F3 at this screen anymore? 2) Also, doesn’t the machine need to be joined to the domain so that when you are done modifying the default profile, you can login as a different user to copy the default profile to a network share?